Originally referred to as “aquatic football,” water polo was developed as a combination of soccer, rugby, wrestling and American football united under an athleticism-testing umbrella: treading water. Although the exact origins of the game that boasts some of the toughest athletes in sports is debatable, somewhere along the rivers and lakes of nineteenth century Scotland and England, water polo planted its roots. They’ve reached far and wide ever since – growing and evolving into a game that is now very different from the first. The modern name of the game evolved from aquatic football to water polo over time. Derived from the English pronunciation of the Balti word, “pulu,” polo describes the soft ball of Indian rubber the game was first played with. And they say that in the early days, players rode on floating wooden barrels and wielded mallets to move the ball, similar to equestrian polo. It’s rumored that water polo began as a means to attract guests to British holiday resorts. Taking geographic advantage of the rivers and lakes, along with the natural competitive spirit of people, owners are believed to have organized the first matches in the mid-1800s. The history of the first official water polo match comes in multiple versions. 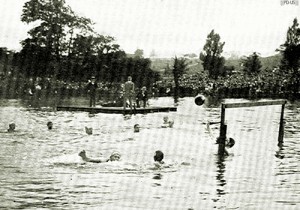 One account places the event at the Crystal Palace Plunge, hosted by the London Swimming Club in 1870. Another account took place along the banks of the River Dee in Aberdeen, Scotland as part of the Bon Accord Festival. Some say that William Wilson, a swimming instructor and aquatic development engineer at the time, drafted the sport’s first rulebook in 1877. Others credit the London Swimming Club with the sport’s initial formal rules. To be fair, the sport developed in different areas of the world very differently, so both accounts could be correct based on the version of the game. Shortly after the first official match(es), the sport began to gain momentum across Great Britain. Players formed organized recreational leagues as the sport garnered popularity. It wasn’t until 1885 that The Swimming Association of Great Britain formalized the sport. The first American game of water polo was played in 1888. It was different than the European version of the game, and like earlier generations of American football, it was very physical. Violence was water polo’s x-factor. Initially, water polo allowed for excessive force and involved a heavy amount of wrestling. 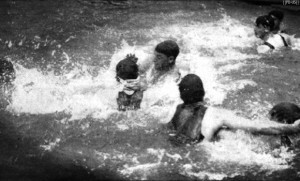 Players were permitted to hold opponents underwater, at times submerged and struggling to the point of unconsciousness. Underwater attacks were standard, and the murky pools and lakes the games were played in were questionable in themselves. Players would commonly tuck the ball into their shorts, swim underwater to the goal, and slam the ball to score. Doesn’t seem fair, does it? The Olympic Committee agreed. Men’s water polo made its debut at the 1900 Games in Paris as the first Olympic team sport ever. Because of the vast difference in rules and physicality regulations between American and the milder European water polo, the European nations did not compete in the sport during the 1904 Olympic Games. They deemed the American version of the game too violent, and the disagreement would last years. 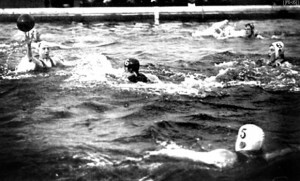 In 1911, Federation International de Natation Amateur (FINA), the international governing body for water sports, officially adopted the European ways of the game. The rebellious United States refused to conform, sticking to their excessively aggressive version of the sport. So aggressive in fact, that in 1912, a National Championship semi-finals game featuring the New York Athletic Club and the Chicago Athletic Association turned into a full-fledged fight among the players. As a result, the Amateur Athletic Union retracted its sponsorship of water polo. By 1914, the US acquiesced and agreed to a milder game. In 1929 an international water polo committee was formed and the European rules governed the game worldwide. Since then, the game has evolved into a skill-focused battle of pure athleticism.